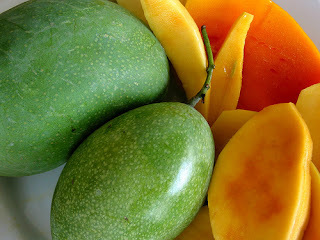 Mango is one of the many kinds of fruit, which can be found in our daily lives. 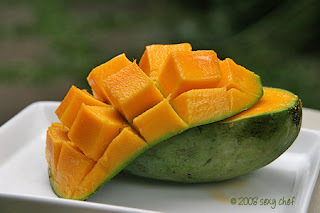 Mango is a plant genus of 35 species of tropical fruits in the genus Mangifera Anacardiaceae. Nobody knows about the place of origin, but most people believe that this fruit comes from the South Asian subcontinent and Southeast Asia, including East India, Myanmar and Bangladesh, it is determined to see form fossils that occur between 25 and 30 million. in the past year. Mango is also common in Indonesia and evenly because mango is well suited to tropical regions of Indonesia. 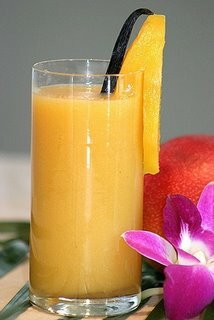 Mango pulpy fruits belong to shape, size, color and aroma (aroma, taste, texture), a wide range. Mango fully rounded form, like mango, long and round gedong as mangoes and mango arumanis manalagi. Two types of mango is probably the easiest we find in society, because the flesh taste sweet, and easy to grow and develop. Mango is believed to be rich in various vitamins, minerals, water from the fiber and carbohydrates. Fiber in the mango around 1.8 percent, contributing enough to the needs of the human fiber. Dietary fiber has a physiological role of the intestine. Dietary fiber consists of mango fruit soluble food fiber, namely pectin and insoluble fiber food, namely cellulose. Each type of dietary fiber is essential for human health. One function of the food soluble fiber that slows the speed of digestion in the intestine. If in terms of chewing function, mastication and swallowing the oral cavity is not very effective (imperfect food chewed and destroyed), then the intestines will slowly digest food more effectively. So that all foods can be broken down easily and is absorbed well by the intestine. Antioxidative ability of mangoes produced by different compounds contained in it, namely beta-carotene, phenolic compounds, lupeol, vitamin C, E, and some minerals such as Cu, Zn, Mn, and Se. These compounds may protect the body from free radical damage, such as cancer. There may be a cancer that occurs here as well, including inside the mouth, or commonly known as cancer of the mouth or oral cavity carcinoma. Although the effect may not directly, but a fundamental change in the genetic material and other cells with smoking, the influence of environmental / industrial factors may be risk factors and triggers the occurrence of intraoral cancer. 3. Source of Vitamin C.
Vitamin C content of mango worthy enough. Every 100 grams of edible ripe mango eating as much as 41 mg vitamin C, mango young even before 65 mg. Thus, when consumption 150 g ripe mango or Mango doll 200 g (1/2 little pieces), adequacy of vitamin C, which is recommended for adult men and women a day (every 60 mg) can be performed. Vitamin C has the responsibility for maintaining and enhancing health capillaries, healthy teeth and gums. He helps the absorption of iron, which in the case of iron deficiency in the body, we are vulnerable (easily) affected by caries. It also inhibits the production of natrosamin cancer run substances. Vitamin C can also create permanent normal connective tissue and aid in healing wounds. If someone has a shortage (deficiency) of this vitamin, the gums (gingiva), it will hyperplasia (enlargement) which may be accompanied by clinical symptoms in the form of bluish-red gums, ulcerated, and bleed easily. Manifestations of vitamin C deficiency in mouth disease is commonly known by the name "Scurvy". a. Gingival inflammation, hyperplasia, edema of the gingival connective tissue. b. Gingiva-colored, red, bluish or purplish with purpura. d. Gingival healing process to be slow. Potassium is found in large numbers on mango fruit. Every 100 grams of mango contains 156 mg potassium. By consuming at least 250 grams of mango, the adequacy of potassium 400 mg per day can be met. Potassium has the function of increasing regularity of heart rate, activating muscle contractions, and help blood pressure. Because the water containing the highest that can be drawn from mango juice or made as a juice. Therefore, the sweet taste and high water causes the fruit is very refreshing when eaten, although somewhat rumpled and dirty. In the markets and supermarkets are now very easy to find the mango juice that has been packaged in the product ready for consumption. In every 100 grams of ripe mango contains 84% water, 41 mg vitamin C, and 73 calories of energy, while the young mango contains 84% water, 65 mg vitamin C, and 66 calories of energy. When compared with the amount of vitamin C in oranges where every 100 grams of sweet oranges to eat, contained 49 mg of vitamin C. So it turns out the young mango vitamin C content is higher. Figures for the needs of the average intake of vitamin C is recommended for every man and woman is 40 mg 30 mg per day. Negative Impact on Dental Health. Containing amino acid is a potential trigger tooth decay. Young mango is known to have the same acid content as that found in sour orange. To maintain healthy teeth, you should avoid foods that contain the pH (acidity level) of less than 4. Foods like these can directly damage the tooth without being able to email and repaired. Food is pH 5.5 and more can cause dental caries can be prevented by brushing your teeth so that the mail will soon be rebuilt as a layer of plaque removed. Tips for Choosing a Mango. If you want to buy mangoes, you can choose a good mango with yellowish-green, smooth skin and sweet taste. Avoid selecting fruits that are too loud or too soft, blue, or smell of fermenting, because that would mean mango was damaged.